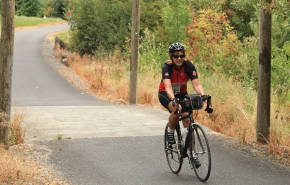 So you’ve signed up for Portland Century, Harvest Century or some other awesome distance ride. Now what? If you’re an experienced distance rider and your legs are already loose for the summer, you’ve got nothing to worry about. Get your bike checked out, get your friends to sign up and you’re good to go. If you’re new to it all, don’t worry – YOU CAN DO IT. The beauty of biking on a supported ride is that there are regular stops with food, water and support. You don’t have to carry your own gear and the routes are planned for low-traffic roads and the best riding. All you have to do it relax in your saddle and crank away at the miles. With good nutrition before and during the ride, you’ll be surprised how well your body checks off those miles. Avoid too much sugar on the morning of the ride. Eat a nourishing, big dinner the night before. In the morning, eat a thorough, protein-rich breakfast that you know to be your personal power breakfast. Eggs, good Greek yogurt (look for the kind with 23g of protein per serving, like Chobani) and nutty granola are all good choices. Get your meal in at least an hour before you plan to hit the course. Pack snacks. The ride will have treats along the way, but pack the favorites that help you meet your dietary needs so you’ll be satisfied at every mile. Don’t be afraid to eat. You’re cranking out miles, you’re earning it and your body craves the calories for power. Drink plenty of water. See our Hydration Guide. This is a recommended training schedule geared toward people who have not been on their bike much in the few months prior to the ride. If you ride 50+ miles a week, you probably do not need to train for the ride. Disclaimer: This is only a recommendation. Pay attention to your body’s needs and do not push yourself in a way that is uncomfortable. Talk to your doctor or a trained professional for more info. We are not medical experts. Six weeks out: 1/2 the total miles of your chosen course (and reward yourself afterward!). Five weeks out: Add 5 miles (and reward yourself afterward!). Four weeks out: Add 10 miles (and reward yourself afterward!). Three weeks out: Add 10 miles (and reward yourself afterward!). Two weeks prior to the ride: If you are not yet at your total mileage, ride 90% of the mileage of your course or more if you’re feeling really good (and reward yourself afterward!). Week of the ride: Unless you’re a regular, experienced distance rider, avoid going on a ride longer than 25 miles in this crucial week. Instead, pedal for around 15-25 miles on the weekend and ride your bike 8-20 miles at a time leading up to the ride. Keep your legs moving, stretch and relax. Stay on the bike, but keep it very light. If you usually go to a stretching and strengthening class like yoga, keep going. Don’t switch up your standard fitness routine, but don’t push yourself too hard, either. What do you do to prepare for a distance ride? I’m usually riding all spring so I feel good when the big rides come around, but I help a few friends get ready by going out on rides with them so I get what it is all about. I’d say this list is pretty good, but I’d leave maybe more time between the weeks on a schedule that isn’t as aggressive but I suppose if you don’t have much time then you could go with this. curious what other people say so I can tell my friends who need this info. Nutrition is my single most important aspect of feeling ggod on a ride and sleep is second. You can likely do more mileage than you give yourself credit for. The key is to keep your effort low: don’t “mash” in a big gear, “spin” the pedals in a smaller gear and try to keep your heart rate down. Sure you won’t go as fast, but you’ll expend less energy and keep your leg muscles fresher.